External Threat Detectors and Environment Monitoring Systems. Just as you have network probes to track traffic, external threat probes keep a steady watch over the premises, alerting whenever something goes wrong that could impact IT operations. The smooth operation of all servers and network appliances depends on the physical infrastructure as well as the IT infrastructure. If there is a flood, a fire, an intruder, a brownout or any number of other problems, waiting for it to show up in a down service puts the entire operation at risk. This is where external threat detectors (ETDs) come in. ETD systems provide early warning of conditions that can lead to equipment failure, giving you the valuable lead-time you need to save your network from costly downtime. Monitoring appliances are simple, offering low roll-out cost, and require no additional resource deployment. These appliances provides 24 hour remote access from anyplace, anytime, and can operate independently or as part of an enterprise management solution, such as Tivoli, HP OpenView, or WhatsUp Gold. ETD appliances can monitor environmental conditions of server rooms, LAN closets, server or communication racks and cabinets. In addition to servicing IT, environmental monitors can be extremely beneficial at chemical and pharmaceutical firms, cold storage facilities, banking, and other industries that rely on environmental control. 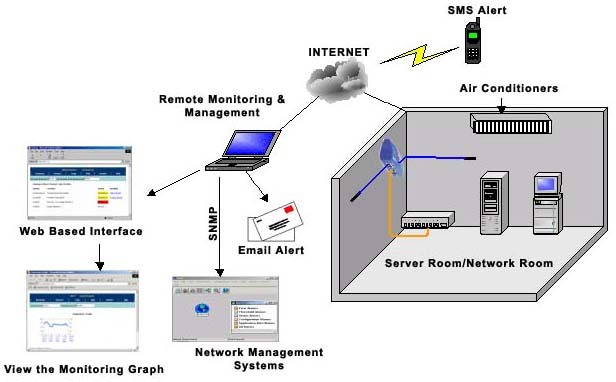 Also known as: Remote Environment Monitoring System, monitor computer rooms, data center monitoring, computer room temperature sensor, server room thermometer alert.